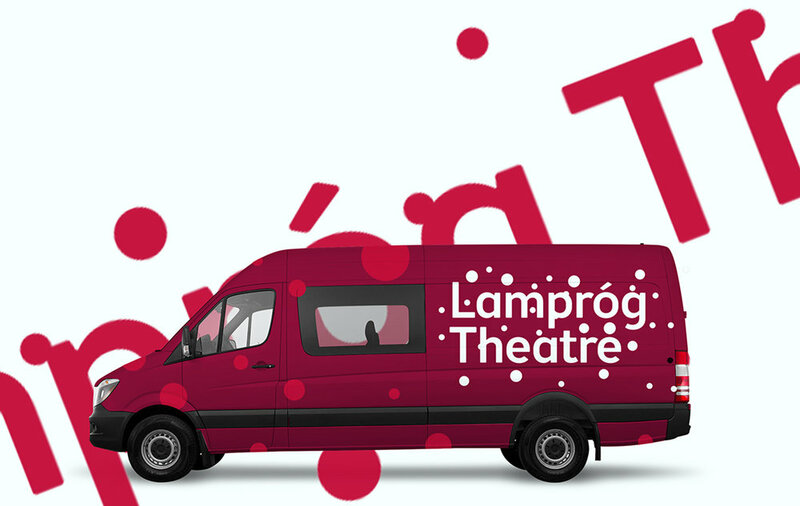 Lamprog Theatre, formerly County Limerick Youth Theatre contacted. We can imagine, to create a new logo mark with guidelines. The theatre was established in 1996 to provide a space and service for young people interested in drama and theatre. Over the years there has been confusion between Lamprog and another theatre group in the same locality. This confusion and the need for expansion were the catalysts for the re-brand. The theatre had recently been through a series of workshops to formulate a new brand name and short, medium and long-term vision for the theatre. The Irish word "Lampróg" means Firefly. The first task for We can imagine was to gather the information from the workshops and gain an understanding of the theatre organisation. The main guiding factor from the creative brief was to create a logo mark that was rooted in the theatre and drama with an air of excellence. The mark also had to be adaptable to other areas, giving Lampró a platform for growth. Lampróg will expand their brand identity into other areas such as education and community outreach programs.